That's about it from us - but stay tuned on BBC Radio 5 Live Sports Extra (and this very) page for a full replay of the game from 09:00 GMT. You can also take a look at Stephan Shemilt's developing match report from Guwahati - or if football's your thing, there's still plenty being spoken and written about last night's Champions League action. I hope you'll join the team tomorrow night for the men's T20 - and then make sure you're here bright and early on Saturday for the final women's match from India. Bye for now. England are up and firing, key players doing what they need to do. Katherine Brunt is bowling superbly and there are very encouraging signs from Danni Wyatt. 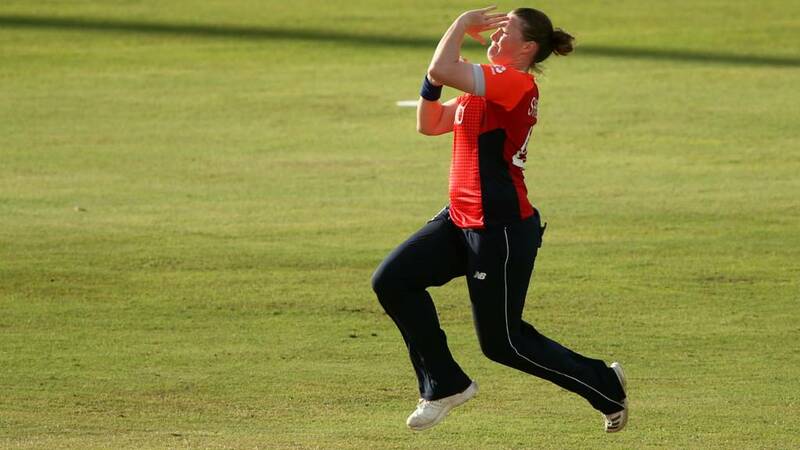 There's more cricket to follow on the BBC tomorrow (Friday) evening, when England's men play the second match of their T20 series against West Indies in St Kitts. Play starts at 20:00 GMT, and we'll have the usual live text service. And you'll just have time to get a bit of shut-eye before TMS returns with the final match of this women's series on Saturday morning, with the team on air from 05:15 GMT. India have been outplayed and will be hard-pressed to avoid a second consecutive series whitewash in T20 cricket. Lots of questions will be asked about the batting and who is going to get those quick runs. MIke Kelcey: Wyatt... The answer to the men's team's problem? Measured, controlled, adjusts to the conditions of the match and pitch. Nah. They'd think that was too weird. I wonder if England might experiment in the last game, and give an opportunity to Sophia Dunkley or even Freya Davies. Craig Moore: Some player is Danni Wyatt! India, especially when they are batting first, need to accelerate more and get those quick runs. You look at their performance in the World T20 as an over-achievement and you are seeing an averaging out of results now. And if you're just getting up and you're kicking yourself that you've missed the game... you can listen to a full replay of the game on BBC Radio 5 Live Sports Extra (and on this page) from 09:00 GMT. CricketHer: Job done by England. Wyatt played some really nice stuff; and great to see Lauren Winfield come in at the point where it COULD have started to all go horrible wrong, but steady things and make a significant contribution. England were probably undercooked in the ODI series, they look much more at home in Indian conditions now. A dominant performance from England. Danni Wyatt now has a half-century in the ODI and T20 series. Both those innings were measured and controlled, knowing exactly what she needed to do. For India it is now six consecutive T20 defeats, they will be hurting I think. Apart from the beginning of this game, when Smriti Mandhana hit those two sixes off Anya Shrubsole's first over, and when they lost three wickets for 11 runs, England have totally controlled this match. Danni Wyatt finishes with 64 not out from 55 balls, with six fours. She gets a big hug from Katherine Brunt, who was the pick of the bowlers earlier with 3-17. A mention, too, for Lauren Winfield whose 29 from 23 balls supported Wyatt well, and kept up the momentum. So, what were we worried about? Deepti Sharma to bowl. Two to win, Wyatt pulls for four, and England win the series! Brunt hammers the ball back to the bowler. It's going to the last over! Brunt survives an lbw shout. Going down leg. Two from seven. If there is any time to bring the boundary riders in it is now. Maybe there is just a sign of inexperience from Smriti Mandhana. India are being singled to death and are doing nothing about it.